Category: Packaging Design, Foxford, Ballina, Co. Mayo. The packaging design that we recently updated for this Mayo based company needed to be very straight forward, easily legible and most importantly stay true to the branding design values & logo design – which were also created/updated for Kelly Kettle two years ago by the Designwest team. The packaging which will be used for the Kelly Kettle product, primarily distributed in North America, was created for a range of dimensions depending on the size of the Kelly Kettle. Kelly Kettle have been a trusted client of designwest for the past few years and we have completed everything for the Business from media packs design, brochure designs right through to signage – through our sister company signwest – for exhibitions etc. For anyone who has never seen these Kelly Kettles in action – check them out – especially for anyone who does any type of outdoor activities – there really is no other product that can boil water as quickly and safely in anything up to stormy wet conditions! We love these products & not only because they are our client, but because our creative director, who is an avid angler and swears by these kettles for boiling water in any condition! Category: Label designs and Packaging Design, Kiltimagh, Co. Mayo, Ireland. Mulhern Brothers West-A-Wake Eggs based in Kiltimagh, Co. Mayo are one of Designwest’s longest standing clients. 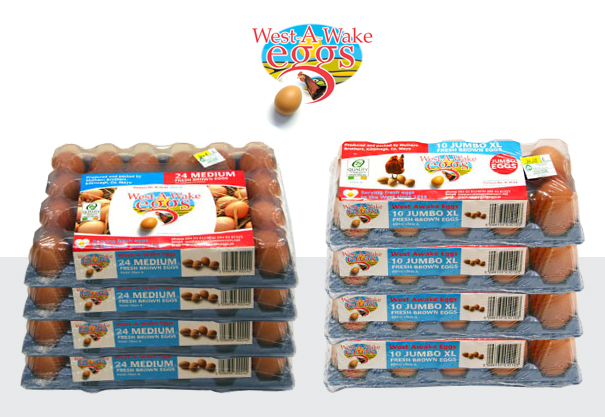 In order to have their product stand out on shop shelves, they asked Designwest to create vibrant new egg carton and packaging designs incorporating the logo design that we also developed for them a few years ago. Incorporating a colour coding system for different egg grades and carton sizes, the new designs are bright and fresh, while still allowing customers to view the eggs inside, which is very important when making a purchase.